← With best wishes for the future…. Letter from the Clerk of the Central Offices of the Society of Friends in London to the Clerks of Quarterly, Monthly and Preparative Meetings in Warwickshire North Monthly Meeting reports relating to minutes, 1904-1907, (2011/029). While I was aware that the Quakers are scrupulous record keepers, I had not appreciated that they would also have such forethought in terms of the preservation of their records. From an archivist’s point of view, if all organisations followed the Quaker approach to record-keeping, our work would be a lot easier! Evidence of planned recordkeeping and preservation by record creators is generally unusual in the archive collections we hold and it is particularly unusual to find evidence of this from over a century ago. However, as a result of the persecution they suffered in the 17th century, over time the Quakers developed a clearly defined organisational structure from national to local level and with it they became assiduous record creators, carefully recording the details of their lives because they did not have access to the formal institutions which did this for everyone else. As a result of their careful approach to record creation, recordkeeping and preservation, Quaker records are a rich resource for researchers, and those of the Central England Area Meeting are an important source for the religious, social, economic history of Birmingham and the surrounding areas as well as for anti-slavery campaigns and international humanitarian causes which the Quakers were involved in. 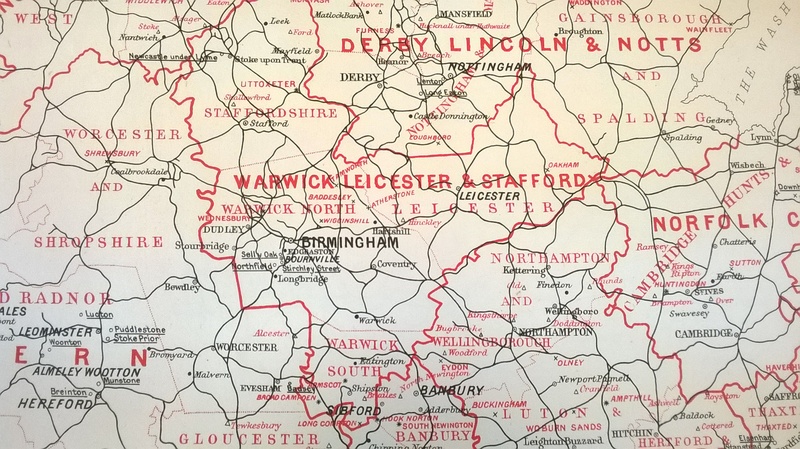 Map showing Quaker Meetings within Warwickshire, Leicestershire and Staffordshire Quarterly Meeting, 1894. From MS 4039 (2008/087) The Lloyd Papers, roll 2, supplement to The Friend, 1894. It seems particularly poignant to have found this document when the Birmingham and Warwickshire Quakers Cataloguing Project funded by a National Archives Cataloguing Grant, has just started. The project aims to catalogue the records of the Central England Area Meeting. 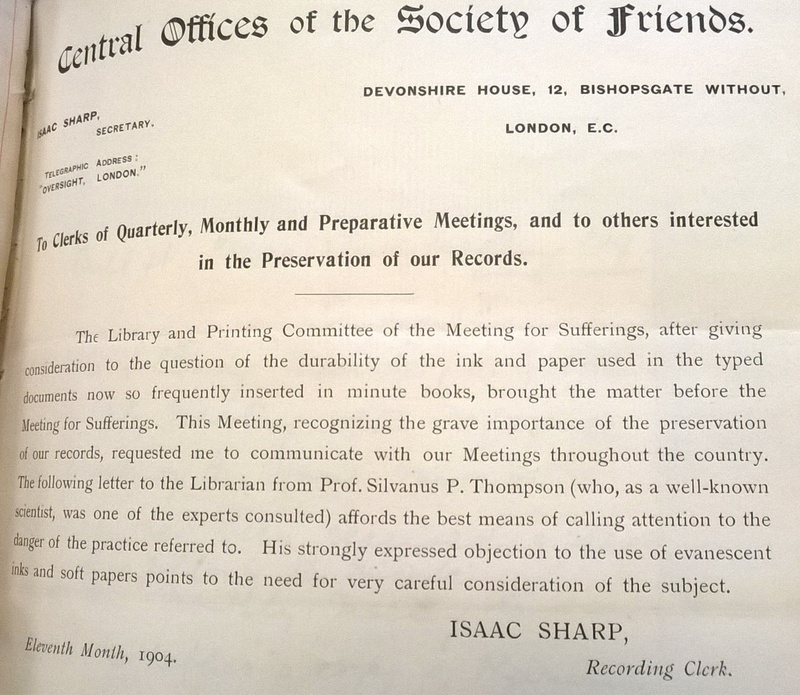 The collection includes records of the Quarterly Meeting (the highest organisational level below the national Yearly Meeting) from 1675 onwards. It also includes records of the Warwickshire Monthly Meeting from 1662, which subsequently divides into Warwickshire North, Warwickshire South and Warwickshire Middle Meetings and the records of the local Preparative Meetings, which include among others Baddsley, Coventry, Dudley, Stourbridge, Shipston, Hartshill, Leamington, Warwick, Redditch, Walsall and the numerous Birmingham-based Meetings at Bull Street, George Road, Selly Oak, Bournville, and Moseley among others. In addition, there are records of a number of special committees established to deal with areas of particular concern such as the Anti-slavery, Education, Housing Conditions, and Peace Committees, and records of the Young Friends, the Friends Sunday School Union and the Friends Temperance Association. The records themselves mainly consist of minutes, but there are also reports, records of Sufferings, correspondence, financial records, property records, membership records, and birth and burial records. Over the next year on the blog, I will be updating you on the project and writing about some of the fascinating records in the collection. This entry was posted in Behind the Scenes, Our Collections, Our Projects and tagged Archives, Birmingham, Birmingham History, Quakers, Religion, The Religious Society of Friends, Warwickshire, West Midlands. Bookmark the permalink.